The word "luxury" has almost lost its meaning. Once used to describe genuinely prestigious products or places, the concept of luxury has been hijacked by a multitude of aspiring or overpriced commodities, from foot spas to chocolates. So what is real luxury? Which are the genuine luxury brands, and how have they reacted to the rise of the "mass luxury" sector? What strategies do they use to lift themselves into the realm of the truly elite? Who are their customers - and what kind of lives do these remarkable people lead? How do luxury brands attract and retain them? And above all, where can the industry turn now excess is out of fashion? 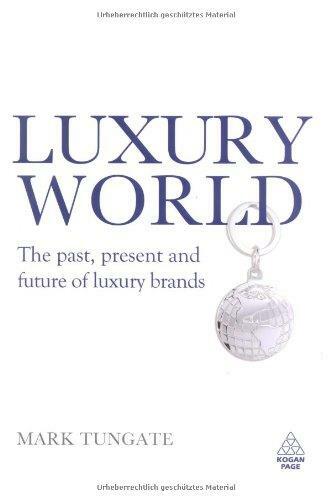 With wit, accuracy and insatiable curiosity, Luxury World takes us on a voyage around the luxury universe, slipping behind the facades of the world's most sophisticated businesses to show the reader how they function. Among other destinations, best-selling author Mark Tungate visits Swiss watchmakers, the Champagne houses of France, the diamond district of Antwerp, the luxury enclave of Monte Carlo, the discreet ateliers of the last craftsmen and a host of brands in Paris - the self-proclaimed capital of elegance. Along the way, he uncovers the true face of today's luxury industry.